It's 9 weeks until KAEM13 and a great point to take stock of my progress towards my second goal of the year. In preparing for the Atacama Crossing this year I was completing my first cycle of full-time training with a focus on performing in a specific race. I went into that cycle of work with many ideas, expectations and great guidance from Ian, but also uncertain about what result to expect at the end of the training period. The race was a success and therefore the build-up period was also a success. However, I came away with more ideas to incorporate into my training process to optimize the training I do. My performance at KAEM13 will determine the value of this current period of training. I feel confident that what I have been doing is more focused and of a higher quality that the preparation that I did leading up the Atacama. I would hope this is true as I need to improve continuously to reach my goals and to perform at the highest level I'm capable of. It's a fun journey and challenge that motivates me every day. An easy run on Cerro San Cristobal. My training volume has not increased since the Atacama. In fact, the total is almost exactly the same as it was over the same period from 30 weeks before the race until now. There are some differences between the two build-ups as I ran races like the K42 Chile and Endurance 50km in the lead-up the the Atacama which added volume in certain weeks (the spikes in blue in the graph below). 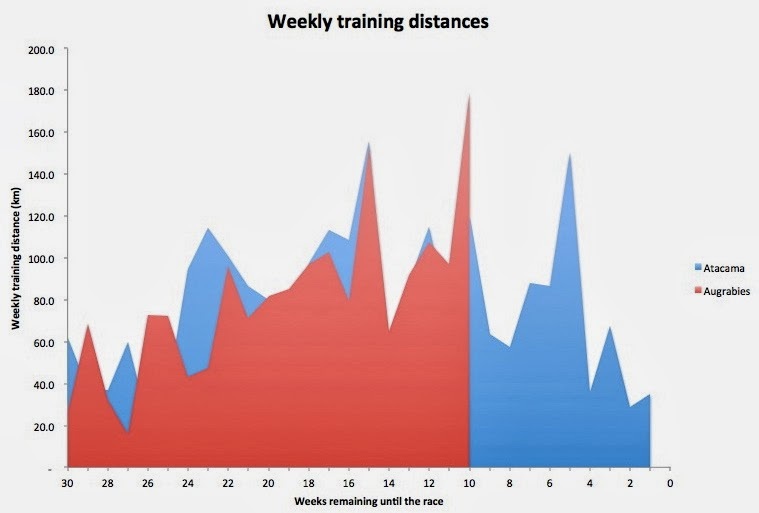 However, my block weeks of race simulation training have occurred at exactly the same points in both build-ups (the large spikes at weeks 10 and 15). I am pleased as I believe the quality of the work has been better within the same volume of training. I have handled the workload much better this cycle of preparation and have not encountered any worrisome niggles or colds to interrupt my training. This has been the most consistent period of training I have gone through and it shows in the ability I have to take on certain sessions without too much worry that the workout might be too hard or long. I'm very happy with how this graph looks right now. An overview of training volume - before Atacama in blue, before KAEM in red. The key factor that I want to prepare for in KAEM is the long day which is the fourth stage. The impact of this race structure is that I will need to be ready for another two stages after the long stage (rather than just one more in the Atacama) and that my pack will be heavier for the long stage because I need three more days of food after the long stage. To prepare I have been running long runs with my pack at race weight. My go-to run has been a long run with an hour of tempo work at the end; such as a 3hr run or a 5hr run with the last hour at a tempo pace. An example is this run I did at the end of July. I have also been training with and testing the gear I plan to use in the race. In this cycle I'm fortunate that I have already done two multi-stage races so I have a good idea of what I want to use, and where I can make improvements so the testing is more about refinement than trying things for the first time. I have a new pack (the Raidlight Olmo 20 used by Massi and reviewed here) that is proving to be a little more comfortable than my home modified pack which was starting to look a little worn after 500km in races. I'm trying some different shoes to see if I can find a good solution for the sandy riverbeds in the KAEM and to improve my day-to-day recovery. Finally I've been using my race food over block weeks with the hope to find a good balance between weight, flavor and variety. When I started with Ian he asked me to do some strength work and suggested TRX. I didn't always enjoy going to do these sessions, but slowly I've become more comfortable with this aspect of training. I've found it makes a big difference for me in two areas of my running. The first is on downhills where I now have more confidence and I feel that the additional strength aids in maintaining my form while running declines. The second is that I feel less fatigued in my shoulders and upper body towards the end of block weeks and I believe that improved upper body and core strength have helped me adapt to running with the pack. I have been more rigorous in looking after my body by using my foam roller regularly and doing active isolated stretching after most training sessions. 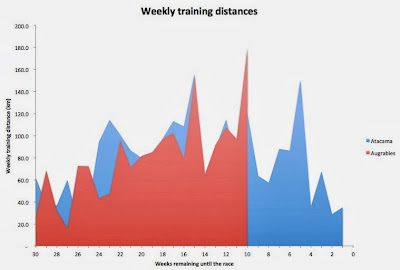 Along with the cautious approach to increasing my volume, I feel that these two activities have helped me to maintain a consistent training approach without delays from injury or niggles. I'm happy with my progress and really looking forward to racing in October. Here's a brief update providing some thoughts of where I'm at this week. Daniel Rowland KAEM13 - Update 1 - 9 weeks to go from Daniel Rowland on Vimeo. Last week was the first week in a five-week cycle that will end with my second simulation block for KAEM. Three weeks ago I ran my first simulation block, a 153km week of 4 consecutive days running with a pack at race weight, which was followed by a recovery week, a 65km week with 3 rest days. Last week followed the typical structure of a non-block week for me. As it was the first week in this cycle the total distance was a little below average. I usually do my long run on Monday as I like to complete the run and know that I have it in the bank early on in the week. I've been doing some tempo work in the last hour of my long runs to add a little intensity. Smooth trail on the Huechuraba side of Cerro San Cristobal. Easy running and photo-taking for the first two hours. Every three to four weeks I do an L2 test. This is a run that I do over the same 12km in the same heart rate zone each time. As I get fitter and more efficient the time for the 12km should decrease for the same level of effort. It's a check to see if my training is on target and it can also warn me if my body is not at the level it should be due to an oncoming cold or potential injury. This week I was a little better than my previous test and on a similar level to where I was 12 weeks out from the Atacama. I'm not race ready yet, but I am heading in the right direction. Depending on how the week is progressing Wednesday is usually a rest day for me. I call it "Wednesday weekend"! However, this week I didn't do a TRX session on Tuesday so I needed to complete the workout on Wednesday. I do TRX twice a week with a set of exercises designed to promote strength in the frontal plane (to strengthen muscles that are used in side-to-side movement which can help to prevent hip and ITB issues) and to build strength in my core and upper body (to help with carrying a pack). This workout takes between 30 and 45 minutes and I do it in the park near my apartment. I've been doing hills sprints at least once a week for the last three months. These sessions help develop leg strength without requiring high speed running (such as intervals) so the risk of injury is lower. I can do a high intensity training session without running fast which is also a close proximation of desert racing where the intensity is high due to the conditions and pack, but the speed is low. I've been making some progress on these training sessions and complete each sprint a few seconds faster than I did when I first started my build-up for KAEM. I run the same 200m stretch of road every time so I know it well. I like the ability to look back and compare my efforts and track progress enough that I'm willing to put up with a lack of variety in the route. I did an easy hour to flush out my legs from Thursday's hills. I really enjoy these sessions as there is no pressure to run hard and I can test out any ideas that I have for my race gear without worrying about stopping to make adjustments. My legs felt quite good and I enjoyed a very quiet day on the running paths. A little gloomy and quiet on the running path today. But still one keen runner training hard! After my run I stopped in the park to do my second TRX workout of the week. This week I did my first speed workout in the build-up to KAEM. It's about 12 weeks out from the race and time for me to start working in some intensity and faster running. Up to this point I've been working on endurance and running strength (through hill sprints and tempos). In this last phase I do speedwork to improve my running economy and efficiency. As my race pace for a multi-stage race is not very fast, this speedwork is also not very fast. I was aiming for 4min/km during my intervals. I really enjoyed this session and felt great running a little faster than usual. As I haven't done intervals for a while my pacing was a little off (I ran too fast and a little inconsistently), but that's something I can improve on in the following weeks. That's a pretty typical week for me. A reasonable mileage which includes a long run, hill sprints, intervals and some strength work. I believe that consistency is the most important factor in arriving at a race in top condition so stringing together a whole lot of weeks like this is my goal. I'm on the right trajectory of improvement towards KAEM and provided I maintain the consistency I should have a good race.